This Memorial Day we figured we would take a look back into one of the oldest mascots while paying our respects to the military with a retrospective of the Army Black Knights mule and the more recent Blackjack. The prospects of Army playing at the new Yankee Stadium also influenced our pick this week, admittedly. The inclusion of the mule for the Black Knights football team is a great story and the addition of a costumed mascot is a nice side dish to the main mascot course. KCCGD pays its respects and we hope you take some time today to do as well. WAY back in the day, circa 1899, Navy showed up to one of the first of many rivaled games between Army with a newly adorned mascot goat. Not to be outdone, the Army fans scrambled to come up with one of their own. A Quartermaster found one hauling an ice truck. Since then, the mule has been an enduring symbol of toughness, strength, and perseverance for the football team. They won that day and continue to do battle with Navy every Thanksgiving Day. The first official mascot showed up as Mr. Jackson in 1936, with some of other more well known mascots like K.C. MO (because he was from there), Trotter, and today’s Raider. There isn’t a rich history for Blackjack, the costumed version of the mule. 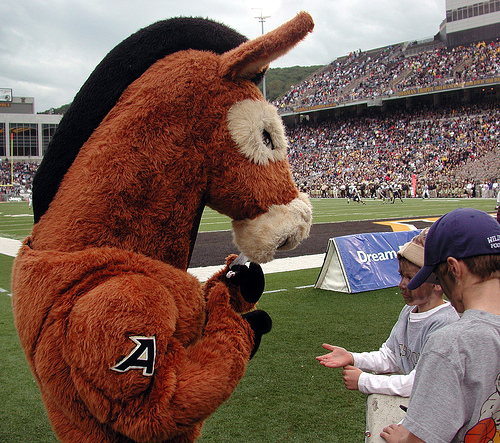 The name Blackjack comes from one of the iterations of the live mascot who first appeared in 1985. That version died of cancer in 1989 and we imagine that the costumed name represents a tribute to the fallen mule. As for the costume itself, what you have in the different variations is a full fury suited fella with a gritted teeth gnarled expression on an enlarged head. Very fearsome indeed. In researching the mules, we did come across some images of an actual Black Knight in full armor. From what we can tell, this isn’t an official sanctioned mascot for the Army. If we’re wrong, please let us know. Obviously the main mascot is the live mule, and we hoped to find more info on the other known and unknowns rabble rousers. What we know about who goes where for the games is that Raider is out for the home games as well as the Navy game while Blackjack is there for all of the games. Confusing we know, but that’s okay. Why is it okay? 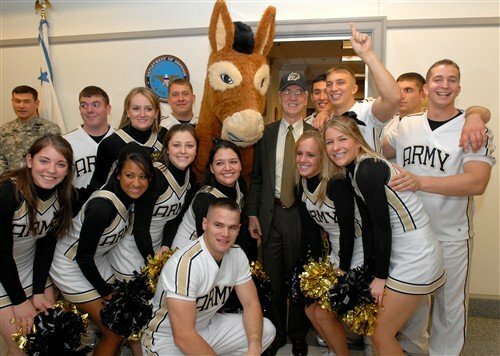 Because the mule is one of the endearing symbols for long standing tradition of the Army as well as its cadet football team. Go back and think of how much has happened with U.S. Military since 1899. We’re talking two World Wars and other major conflicts including the Vietnam War and the Gulf War. Many fallen soldiers laid their lives down for this country and the Army, check that, the United States still preservers. The U.S. still remains strong. The Liberty we have came from the tough resolution that Americans have and the men that lost their life fighting for it. So we can forgive marginal costumes or inconsistent mascot information for the Army Black Knights. Today as we inspect The Black Knights football mascot, let’s try to remember what’s important. No, they don’t have the best group of mascots to lead their cheering charge during the games. But what they have is one of the best symbols of competive and military struggles, not a silly little Banana Slug or some other off the wall yell leader. For all of the soldiers out there thank you for protecting and serving our country, both alive and fallen.